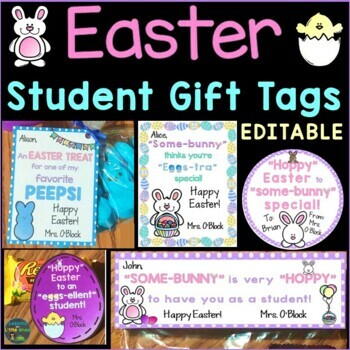 Easily create personalized, memorable Easter gifts for your students with these editable and colorful student gift tags. Simply print and attach to your favorite Easter treats. 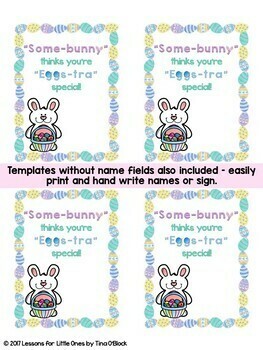 Includes 8 different Easter designs so you can use them for multiple classes, from year to year, or as individual gifts. 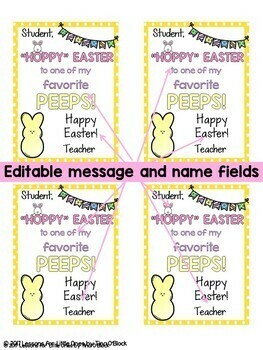 Also includes two time-saving versions of each set of Easter student gift tags - one that has editable boxes for student names, teacher name, or personal message and one that has no editable name fields that can be easily printed out and signed by hand for a more personal feel. 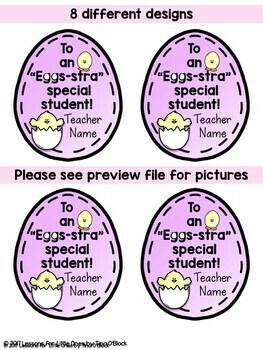 The following Easter student gift tags are included (please see the preview file for pictures of each). ALL TEXT is editable so you may personalize and customize the tags for your needs (images are not editable). Please note that some of the text (words such as "some-bunny", "eggs-tra", "eggs-ellent") contains images that are not able to be moved or edited due to the copyright restrictions by the clip artists. • "Some-bunny" thinks you're "eggs-tra" special! • "Hoppy" Easter to an "eggs-ellent" student! • An Easter treat for one on my favorite peeps! • "Hoppy" Easter to one of my favorite peeps! • "Hoppy" Easter to "some-bunny" special! "I found this packet most helpful. It helped me to be more creative with the simple gifts I gave to all of the students that I participate in as a special education teacher. I found it most helpful that I could edit them as needed. " - Marilyn L.
"The kids and parents enjoyed these tags!" - Lena P.
"Thank you... this is so cute!" - Jennifer S.
"I love it! Thank you!!" - Bethann N.
"Great resource!" - Kirsten B.